Went to Chedi Thai Restaurant at Newtown on Saturday night to celebrate Mother's Day (Eve). Original plan was for Sunday, but my brother can't make it. For some reason, our GPS PND (personal navigation device) conked out again. Can't even turn it on. Doesn't seem to be the battery as we're sure it's charged. Good thing I brought along my GPS Bluetooth module with me, which I don't normally do. Paired with TomTom Mobile on my E65, we were able to find our way to Newtown. As usual, traffic is really bad. Two lanes each way with one lane dedicated for parking. We spotted an empty spot, so I quickly slipped the car in. No wonder the spot was free - it's 4P Ticket. With an hour to kill before our parking time is up, we walked along the sidewalks of King Street. Lots and lots of restaurants and shops selling trinkets and curios. Best find of the night is Gould's Book Arcade. 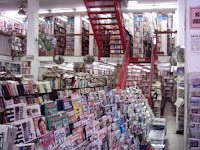 This two-story shop probably has more books than a library. Massive collection of audio cassette tapes and LPs, comic books, posters, concert programs, etc. Fortunately for me, I'm currently trying to pare down my own book collection. For obvious reasons, I decided not to join GF's Mother's Day lunch. Instead, I visited them afterwards and gave her mom a bunch of chrysanthemums. That's actually the first time I bought anyone flowers. I hope she's happy. Dinner is fried rice and KFC at GF's house. To be fair, I also bought Mom some flowers on my way home.